Propolis is the protective substance gathered and used by bees to disinfect and protect their hives from pathogens. 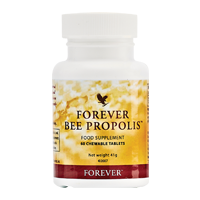 The propolis used in Forever Bee Propolis has been collected from flowers in the Sonoran Desert Arizona, one of the most pristine environments, untouched by over-development and pollution. We have been producing propolis supplements for decades and we’re one of the oldest manufacturers on the market, proud to offer superior quality and purity you can trust. Take 1 tablet, twice daily. Keep out of reach of young children. Store tightly closed in a cool, dry place. Do not use if seal under cap is broken or missing. Food supplements should not be used as a substitute for a varied and balanced diet and a healthy lifestyle.